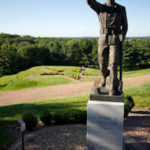 The Highground’s Doughboy is different than the traditional Doughboy statue in the United States in several respects. The traditional statue shows the right arm being stretched out with a cupped hand, as though he was throwing a grenade, and the left hand holding his rifle at the ready. As we have already stated, The Highground is not a War Memorial, it honors Veterans, their service, and their sacrifices. Keeping this in mind, our Doughboy was changed so that he has his rifle at parade rest, not at the ready. And, his right arm is raised up with his hand open as if to greet visitors as they enter the park or bid a fond farewell and safe trip as they leave. We are not sure why World War I Veterans were called Doughboys, we have four stories that have been told to us, so if you have the answer, please let us know.